Hello again, today's Intro is Crafty Labels. I must admit, I enjoy making tags more than cards during the holiday season. I'm a very "visual" person, I love the display of wrapped gifts with pretty tags under the Christmas tree more than anything! With every holiday release, I'm always itching to design some cute tags to add to my growing collection. I feel October is a great time to grab those holiday stamps for your cards, and by November we should start thinking tags! I created a quick set of tags with Crafty Labels. So many possibilities. The flourish frames would be great as focal frames on a card front too. The sentiments are sized just right for tags or cards. And they also look perfect for the outside of envelopes. This set is definitely something you can use all year round! 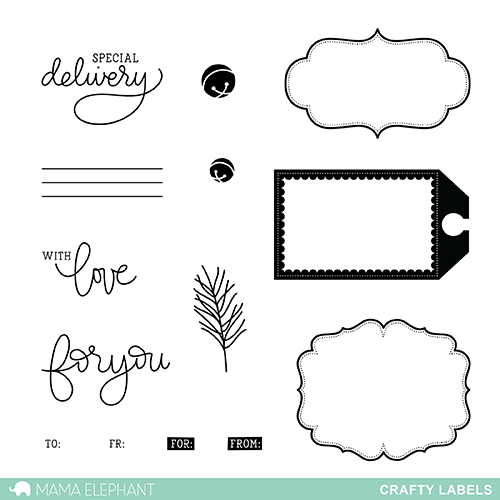 What would you do with Crafty Labels? Gorgeous! these are so pretty they could don any card! I love this set! Your tags are so cute, love the bells! This set is fun, so many possibilities... hmm I love that you include the lines in the set, I think I might use this set to dress up the envelopes - something I don't always do. Love the script fonts as well. Beautiful! I would use tags in white or red on craft roll to create wrapping paper & either use sentiments or add recipients name....would personalize gift!! I would use Crafty Tags for all the presents I give! Super adorable release! Love all the new stamps and die sets!